This week we are missing our Happy Place so let’s take a look at some of our favorite memories and recommendations straight from The Rocky Mountains to you! Start channeling your inner John Denver now. We can all agree hiking is a must while visiting Colorado when snow is not an obstacle. Unfiltered Adventure plus Maureen enjoyed a leasurly hike near our condo in Georgetown. We went for Silver Creek Trail and snapped some selfies along the way. It was fairly easy and we could all do it together! Leslie went on a family trip to Steamboat Springs where she and her husband Bobby hiked until they ran out of trail. It was a little challenging in some spots, but not too tough. They appreciated the great views of the waterfalls the whole time! This was a beautiful hike! The Breon family ventured out to Georgetown last summer, Silver Dollar Lake Trail was a must when we learned our parents wanted to hike. This trail is gorgeous, in fact it kind of reminds me of Lord of the Rings minus the hobbits. The final stretch to the highest lake is a doozy, but the rest is pretty easy going. I’d recommend it to anyone wanting to hike. When you are up for a challenge you will want to tackle an infamous Fourteener. Colorado has 58 mountain peaks exceeding 14,000 feet (known as fourteeners or 14ers to the locals) — the most of any state. Coming from Kansas the elevation is breathtaking. The hike itself is challenging but when you can’t breath while hiking up a mountain things get really interesting! I enjoy stopping every ten steps to gasp for air while a local 9 year old child sprints past me unphased...and barefoot. Coloradians right? My favorite 14er (yes I’m using the slang of the locals) I have hiked is Mount Bierstadt which is located in the Front Range of the Rocky Mountains. It was challenging but lush and green which in my opinion provided more pleasing scenery than Quandary Peak which seemed to be primarily bare trees and boulders. Quandary Peak is the highest summit of the Tenmile Range in the Rocky Mountains of North America. Hiking generally segways to a brewery. Staying hydrated is important! Broken Compass Brewery was recommended by a long haired fella in a random ski shop in Breckenridge who was quite fond of the word dude. We love everything about this local hangout - the decor, coconut porter, the dogs, and the people! Thanks for the recommendation, Dude! Guanella Pass Brewery is fairly new to Georgetown, CO and obvi it’s a great addition. We love relaxing on the patio nestled at the foot of Guanella Pass. Try one of our favorite beers, a roasty, bold stout with hints of chocolate and coffee courtesy of the roasted barley and dark chocolate malt. Leslie recommends Butcherknife-Steamboat claiming it was one of the coolest breweries in Steamboat. Really friendly and TONS of beers to choose from. Must be good beers if she sampled approximately 12 of them, nobody is doubting that estimate! Great place to “rehydrate” after a hike! 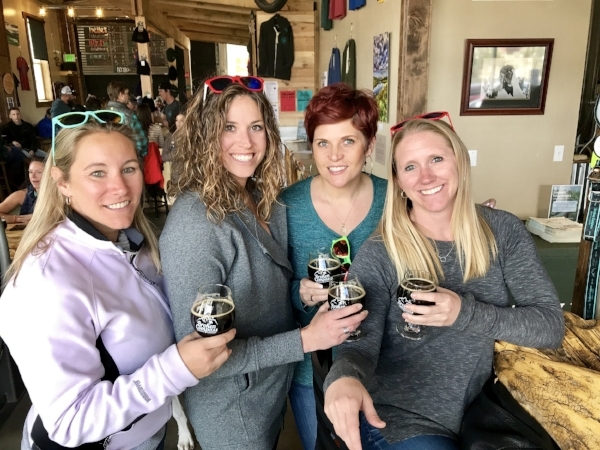 Dillion Dam Brewery was discovered on one of our first girls trips to Colorado. Great place to chill on the patio. We personally loved Sweet George’s Brown. Mother’s Saloon - remember when we went there?? Checkout our blog post from that adventure! Downtown Georgetown is a place where everyone can find themselves enjoying the simplest things. It is quaint and the shops are cute and fun to explore. Georgetown Valley Candy Co is a must stop for ice cream and an assortment of handmade candy. You must grab brunch at The Happy Cooker and a fresh Paloma at Lucha Cantina. Also, the lake and Clear Creek are peaceful and surreal. How lucky are we to wake up to the soothing sounds of the water every morning to start our vacation days? We enjoy exploring and walking around the water. Oh, yeah and we can’t leave out Coopers on the Creek, we love sitting outside over the Creek trying new beers! Kristi and Steph have more experience on us and pretty much shred the mountains. Props to Billy who is pretty good on a board, at least Kristi and Steph say he is. I sure hope so, he better be good to justify this outfit. Not up for hitting the slopes? No problem. Checkout Fat Tire Biking - we had a blast riding the bikes, even if we turned into a slow and cautious old lady while the boys barreled through the terrain! The guide called it a little intense, and we would call riding by a river and embankment a little intense too. Best part was riding through a wedding photo op! Sorry bride and groom! You guys, we can’t forget to mention the epic day we stubbled upon a Burro Race. Oh my gosh, it was a glorious demonstration of stamina and stubborness! What’s that you say? Burros aren’t your thing? So you are more into the urban scene, well no problem. Have you heard of a place called Denver? Highlands is a very cool neighborhood close to downtown - Checkout Linger which has an awesome rooftop bar and some interesting food options. Fun fact-it used to be a mortuary! Creepy! Also check out Williams & Graham . It is a very cool Speakeasy type bar where you enter through a bookshelf. Say what?!? A hidden passageway? Just make sure Colonel Mustard isn’t in the dining room with a candlestick. They serve a gin cocktail that rivals the Beautiful Red Bell at Manifesto in Kansas City! Denver offers a huge variety of restaurants, bars, and shopping. What’s not to love? There are also amazing hats which are on trend and even encouraged when adventuring. We may explore beaches, wineries, Vegas and our hometown of Kansas City but our cozy condo tucked away in the mountains is always going be at the top of our favorites list. I couldn’t have said it better Kristi! Only 112 days until we are back in our Happy Place! We still did not escape! Happy Friday Friends! Who's ready for the weekend? I love the new Boulevard pints...I mean, who doesn't Thank Boulevard It's Friday?? We tried several new spots last week and attempted to solve a mystery to escape a room again. Andrea and I (and the rest of the fam) tried to figure out the casino mystery to get out of the room at Breakout KC. We started off strong with Andrea nailing the first clue and then went downhill fast! I don't want to spoil the game, but I must admit that I was absolutely useless! I don't think I figured anything out!!! The game master did tell us we were really close to being done...only like 20 more steps to figure it out! You may remember another failed attempt last year...apparently these are not our forte! Things we are good at-happy hour! Kristi, Steph, and I met Steph's sister Mariah at Stagecoach Tavern. It doesn't look like much from the outside because it is in a strip mall, but the inside is really cute. And they had a great Horchata Stout and it was a crowd favorite. Not too sweet with great hints of cinnamon. Kristi arrived first and got the scoop. The dining room is TINY right now, but they are expanding into the space next door soon. Upstairs is a small, but elegant space with a cool modern vibe and the basement is a beautiful European inspired wine cellar (group pic above). Apparently they do events once a month-alternating food event and drink event. The restaurant also does thirsty Thursday and offers half price bottles of wine. We missed it by one day!! I have a feeling we will be back!! Since we were venturing out to a new place, we decided to try a new to us wine. Nebbiolo is a full bodied red that was great while we waited for everyone to arrive and paired well with all of the food! The concept is really cool. All of the plates are very small so you can order several courses and share with friends or a date. We had sprouts with pulled pork and it was fantastic! The mix of flavors was so unique and delicious. Crispy brussel sprouts, radish, rosemary fried cashews, soy honey, candied lime, pulled pork shoulder. We also had the arancini-fried risotto-twist my arm! For the second course most of us tried the papparadelle with white bolognese. Kristi ventured out and went for the tortellini-red pepper pasta, milk braised beef short rib, caramelized shallot, pan sauce, pistachios, smoked prosciutto, parmesan. Again-these are super small portions so that you can try lots of things. You definitely wouldn't order only a pasta (unless you want to leave hungry). It was perfect for our group of girls...men would definitely need their own courses! The osso bucco had the best reviews and was highly recommended by our awesome waiter. It came with pureed truffle butter beans that paired so well with the espresso braised pork! We surprised ourselves and went for the chicken as our other main course. Bone in, crispy skin, and perfectly cooked! It came with pickled peppers, squash risotto (so good), pear, fried broccolini, pancetta, lemon brown butter. I never order chicken when I go to a restaurant, but this is something I would get again! In case you were worried that we are falling down on checking off spots on the Winter Warmer passport, fear not! Plate. is on it, so we got another stamp! We hope everyone has a very merry unfiltered week!